The Centers for Disease Control and Prevention estimates that ~40 million Americans smoke cigarettes , while the World Health Organization fixes that number at over one billion worldwide, with consequences including cancer, peripheral arterial disease, and chronic obstructive pulmonary disease (COPD). While stem cell therapies represent viable treatment options for cigarette smoking-related diseases , smoking can inhibit the functionality of patient-derived stem cells (including endothelial progenitor cells and hematopoietic stem and progenitor cells) perhaps ruling out autologous applications and making these stem cell therapies reliant on healthy donor cells. In a new STEM CELLS study, researchers from the laboratories of Keith L. March and Dmitry O. Traktuev (University of Florida, Gainesville, Florida, USA) now reports that cigarette smoking also negatively influences the therapeutic potential of human adipose-derived mesenchymal stem cells (ASCs) . When comparing ASCs derived from female cigarette smokers (CS-ASCs) and non-cigarette smokers (nCS-ASCs) in vitro, Barwinska et al. discovered that CS-ASCs failed to support cocultured endothelial cell (EC) survival, proliferation, and vascular tube-forming activity as well as nCS-ASCs . 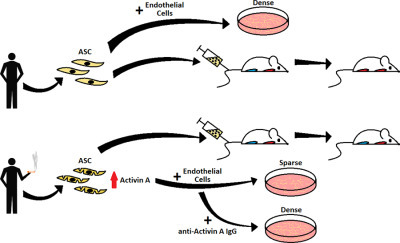 Meanwhile, analysis of the therapeutic potential of ASCs in vivo highlighted that systemically injected CS-ASCs exhibited a significantly reduced ability to improve blood flow in ischemic mouse limbs when compared to nCS-ASCs. Unfortunately, this finding suggests that treatment of peripheral arterial disease with autologous CS-ASCs may not represent a viable approach. To discover why smoking inhibited the in vitro and in vivo functionality of ASCs, the study assessed the impact of smoking on the levels of ASC-secreted factors. Interestingly, smoking reduced the release of certain angiogenic factors (hepatocyte growth factor [HGF] and stromal cell‐derived growth factor 1 [SDF‐1]), but increased the release of the angiostatic/pro‐inflammatory factor Activin A . While HGF and SDF1 supplementation did not rescue vasculogenesis, treatment with an anti‐Activin A antibody returned lost functionality to CS-ASCs; a finding that may point towards a potentially exciting means to improve the in vivo therapeutic potential of ASCs in smokers. The authors hope to continue their studies employing larger numbers of CS-ASC samples from both female and male donors to endorse these therapeutically relevant findings and address any gender-specific effects. If confirmed, the authors suggest that these findings may exclude smokers from receiving autologous cell therapies, as allogeneic cell therapies might represent the preferred treatment approach. For more on how cigarette smoking affects the therapeutic potential of ASCs, stay tuned to the Stem Cells Portal. Does Activin-A inhibition/antagonism represent a bona fide target to enhance the clinical output of smoker-derived ASCs in human patients? Does cigarette smoking affect further therapeutic applications of ASCs? What smoking-induced mechanisms lead to reduced ASC therapeutic potential? Jamal A, King BA, Neff LJ, et al., Current Cigarette Smoking Among Adults - United States, 2005-2015. MMWR Morb Mortal Wkly Rep 2016;65:1205-1211. Weiss DJ, Casaburi R, Flannery R, et al., A Placebo-Controlled, Randomized Trial of Mesenchymal Stem Cells in COPD. CHEST 2013;143:1590-1598. Barwinska D, Traktuev DO, Merfeld‐Clauss S, et al., Cigarette Smoking Impairs Adipose Stromal Cell Vasculogenic Activity and Abrogates Potency to Ameliorate Ischemia. STEM CELLS 2018;36:856-867. Merfeld-Clauss S, Gollahalli N, March KL, et al., Adipose tissue progenitor cells directly interact with endothelial cells to induce vascular network formation. Tissue Eng Part A 2010;16:2953-66. Merfeld-Clauss S, Lupov IP, Lu H, et al., Adipose Stromal Cell Contact with Endothelial Cells Results in Loss of Complementary Vasculogenic Activity Mediated by Induction of Activin A. Stem Cells 2015;33:3039-51.